The new cylinders according to DIN ISO 15552 standard in AISI 316L Stainless Steel Series AMX proposed by A.P.I. are available in bores from 32 mm to 200 mm, and are realized with round tube and external tie-rods, standard with adjustable cushionings and scraper ring in special polyurethane specially developed for the applications it is intended for. These pneumatic cylinders are characterized by a modern, clean and tidy design, also in details, as the mirror polishing. The front end cap is made in such a way that the sealing ring and the guide rail can be removed to an easy replacement of the sealing if necessary also on board, to reduce maintenance time. Standard version with simple rod, with through rod, with FKS seals for high temperature (-20°C ÷ +150°C, about -4°F ÷ +302°F) or low temperatures (-40°C ÷ +80°C, about -40°F ÷ +176°F) and special version on request, in addition to the usual possibility offered by A.P.I. of tailored solutions for satisfy any Customer’s need. The series is completed by the ISO mounting accessories, also fully realized in Stainless Steel. 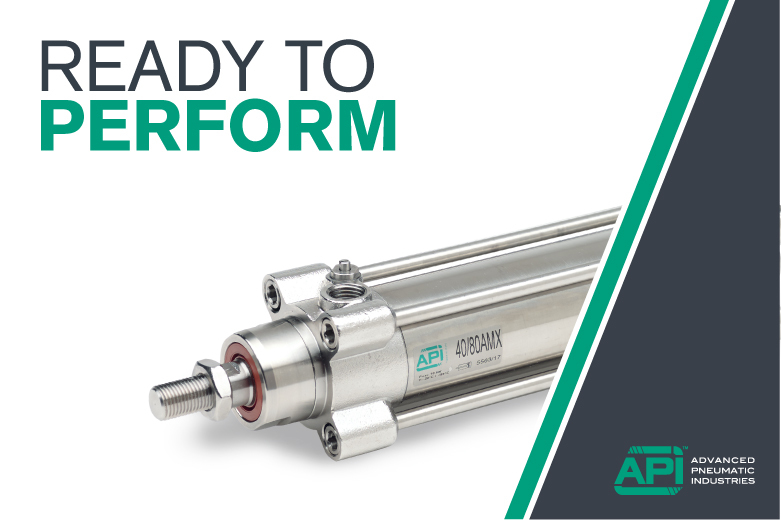 The pneumatic cylinders of Series AMX are designed and manufactured for the Food&Beverage, the chemical, the pharmaceutical and the medical industry: the AISI 316L Stainless Steel they are made of, allows the use in corrosive environments and in general in all those applications where it is essential to maintain the highest level of hygiene and cleaning. The lubrication with synthetic food grade grease complies with FDA Directive section 21 CFR 178 (reg. NSF H1) ensure low friction and a stable and durable lubricant layer, and at the same time provide a completely eligibility for accidental contact with aliments. On request these components can be supplied according to ATEX 2014/34/EU Directive, so they are suitable for a safety use in potentially explosive atmospheres. The seal "A.P.I. CONTROL SYSTEM", released only after the product has passed strict controls, ensures its quality and long last duration.